Attorneys will learn how local digital marketing coupled with a well designed web site can help increase client acquisition while lowering the cost per acquisition from within a local area. "Mr. Aspland's "Local Digital Marketing for Attorneys" has been approved for CLE credits in Vermont & Maine & is a "SRO" room at every Bar event it has been presented at. Digital marketing is rapidly coming to be recognized as the most effective way to attract new clients and retain old ones. How can you increase “leads” from search marketing, local online marketing, and other strategies (including social media)? Find out with SEO (search engine optimization) expert George Aspland, founder of eVisionSEM. Mr. Aspland’s “Local Digital Marketing for Attorneys” has been approved for CLE credits in Vermont & Maine & is a "SRO" room at every Bar event it has been presented at. You’ll learn how search and local Internet marketing coupled with a well designed web site can help build your online presence and increase your client acquisition while lowering the cost per acquisition from within your local area. What are those “Sponsored Listings” (PPC) in the search results and how can they help increase my client load? Employing Local, Social, & Mobile Marketing to increase local clients from organic search listings like Google Maps, Paid Search Advertising, Directories, Online Yellow Pages, Social Media and related web sites. There will be plenty of time for Q & A. This presentation is usually 90 minutes long. 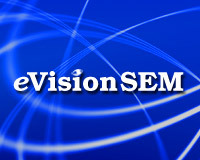 eVisionSEM founder George Aspland has been developing and optimizing websites for companies and organizations, large and small, around the world since 1998. He speaks regularly on the subjects of improving conversion rates on web sites and Search Engine Optimization (SEO: improving results from search engines) and is author of the book, The Guide to Search Engine Marketing, a step-by-step approach used by organizations seeking to optimize their websites. Mr Aspland is a regular contributor to Search Engine Land the industry’s leading online publication for the latest search news, research and analysis, commentary and expert advice and Webmaster World’s PubCon Social Media and Search Marketing Conferences. 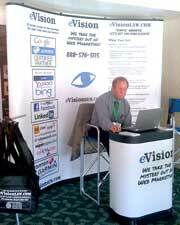 eVisionSEM, eVisionLAW, and eVision are trademarks and/or service marks of eVisionSEM LLC.